Homeowners all over the country have been in love with farmhouse style since Joanna Gaines first instroduced us to shiplap on Fixer Upper in 2015. While the trends may have evolved over the years, we still swoon over natural wood, reclaimed lumber, and anything rusty, rescued or repurposed. Here are some examples of how these trends might look in 2019. First up are custom built wood light fixtures. This fixture was made using a chestnut wood beam from the 1800s, three chicken feeders and a log chain. Can't get much rustier or more repurposed than that! Next is an antique wash stand purchased at the Nashville flea market but repurposed as a modern bath vanity. There are many ways you can achieve this look in your own home - click HERE for more ideas. Homeowners are also loving reclaimed wood flooring like this tobacco barn wood flooring (the dark areas you see are actually smoked wood!). Vintage beams have never been more popular and are being used everywhere, from fireplace mantles to light fixtures and floating shelves. And the rougher the better! It’s even more meaningful if the piece has a documented history. The first mantle pictured here was originally a beam in the Louisville National Guard Armory, and the second is from an 1860's Kentucky log cabin. Metal accents are also incredibly popular. Whether it’s metal chairs, corrugated roofing, or just an old antique safe, these relics provide personality to your space. Add a little rust and it’s sure to be a hit! 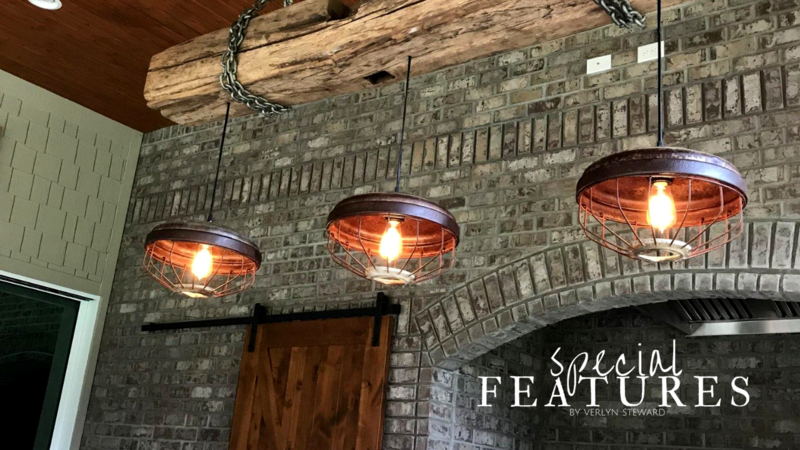 No one knows exactly what the next big thing in design will turn out to be, but these rustic, earthy trends don't seem to be going anywhere anytime soon!